- On the ground floor there is a cosy living room with couches, TV, dining table and large windows opening up onto the terrace and garden. A fully equipped kitchen and adjacent outdoor terrace with table and benches. Bedroom with 2 single beds. Bathroom with shower. - Following the stairs up to the first floor you’ll find a spacious bedroom with double bed and piano, a bathroom with tub, a bedroom with double bed and ensuite bathroom with shower, an external bedroom with two double bed and ensuite bathroom with shower. 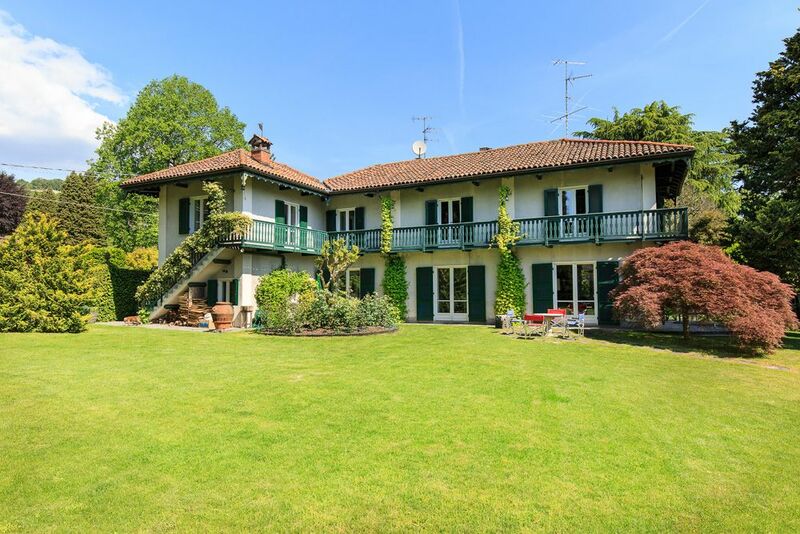 The garden (2000 m²) has been lovingly and caringly designed with a perfect manicured lawn, sunny relaxing zones and shady areas offered by various type of trees. The large swimming pool is surrounded by a deck with sun loungers and under the pool deck is a changing room with gym equipment and a bathroom with shower. This vacation villa is located in Solcio di Lesa in a residential area guaranteeing peace and tranquility. The small village center of Lesa offers restaurants, bars, ferry station and train station. Within walking distance there are a few nice small beaches (200m) and a sports club (100m) with fitness center, large outdoor swimming pool and tennis courts. Lesa lies half-way between the towns of Arona (7 km), a lively town at the south end of the lake, and Stresa (10 km), the most popular tourist destination of Lake Maggiore with its many shops, restaurants and a beautiful lakeside promenade. From there you can hop on any ferry and explore the lake, its magical Borromeo islands and the natural beauty in both Italy and Switzerland. Easy day trips are possible to the cities of Milan, Turin and Lugano, the famous Piedmont vineyards, the romantic Lake Orta and the nearby mountain valleys. - The 'external' bedroom can only be entered from the outside balcony (not internally connected). This balcony can be reached either from the first floor or by stairs from the garden. - Swimming pool open from May to September (contact us for the exact dates). - The pool area can be closed by a fence for the safety of the children. Included: Water, electricity, gas, satellite TV (SKY), DVD, wireless internet (ADSL), dishwasher, washing and drying machine, baby bed and high chair, gym equipment, ping pong, garden, swimming pool (12 x 8m – depth until 2,5m), parking Extra to be paid cash upon arrival: - Security deposit (refundable): 750 euro - Final cleaning (obligatory): 200 euro - Bed linen and bathroom towels (obligatory): 10 euro per person - Heating house (metered): according to consumption - Heating pool (upon request): 150 euro per day (minimum 7 days) - Tourist tax: to check upon arrival if applicable - Domestic animals not allowed Note: - The 'external' bedroom can only be entered from the outside balcony (not internally connected). This balcony can be reached either from the first floor or by stairs from the garden. - Swimming pool open from May to September (contact us for the exact dates). - The pool area can be closed by a fence for the safety of the children. Additional services: Private chef and other catering options, pre-stocking, extra cleaning and change of linen, personal trainer and massage, tour guide, boat rental and other extra services (upon prior request only - to book directly with the service provider).